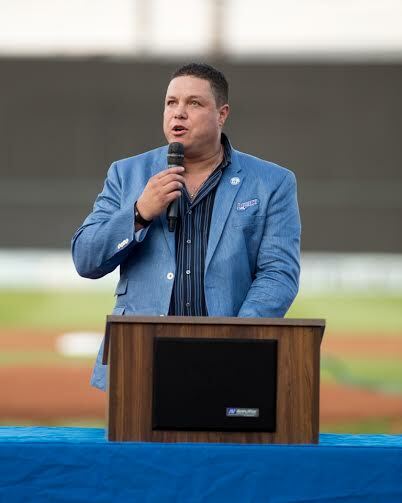 The Bridgeport Bluefish honored the club’s all-time hits leader, infielder Luis Lopez, with Luis Lopez Day and retired his number on Saturday, September 19. Lopez played with the Bluefish from 2008-2014. Aside from leading the ‘Fish in all-time hits with 905, he also holds the All-Time Bluefish career records for games played (898), at-bats (3,338), doubles (149), extra base hits (208), runs batted in (469) and walks (400). Luis spent parts of two seasons in the Major Leagues, appearing in 41 games with the Toronto Blue Jays in 2001 and 11 games with the Montreal Expos in 2004. In 52 career Major League games, Lopez owns a .228 batting average with three home runs, 10 RBI and 10 runs scored. The 20-year pro has appeared in a total of 2,227 career minor league games, owning a .290 batting average with 175 home runs, 1,283 RBI, and 1,144 runs. The Bluefish will honor those accomplishments by celebrating Luis Lopez Day at The Ballpark at Harbor Yard and retire his #19 jersey.